Coral Gables Gallery Night Live! Between the Lines of Nature Date: March 5 @ 6:00 pm - 11:00 pm, Location: Coral Gables Museum 285 Aragon Avenue Coral Gables, FL 33134 MAP oin us for the Opening Reception of the exhibition “Between the Lines of Nature”; Tina Salvesen and Elisa Albo at the Frank Lynn Gallery – a conversation between artist’s books and poetry. In this occasion we will also premiere The Portfolio Review Series in the Community Meeting Room, where a group of artists has been invited to bring their portfolios and discuss their creative processes and latest ideas with the community. DEERING SEAFOOD FESTIVAL Date: MARCH 31 Location: Deering Estate 16701 SW 72 Ave. Miami FL 33157 USA MAP Cost:$25 Featuring fresh catches from the sea, chef cooking demos, live music and a family-friendly atmosphere, the Deering Seafood Festival offers entertainment for all ages. READ MORE MIAMI MUSIC WEEK: Date: MARCH 25-31 Held annually and overlapping with Ultra Music Festival and Winter Music Conference, Miami Music Week attracts thousands of artists and electronic music industry delegates from 70 countries to the Magic City. The top tennis players in the world compete at the Miami Open presented by Itaú tennis tournament. This is the first year the event will be held at Hard Rock Stadium. Tickets start at $20 for early rounds and $275 for reserved seating for the last four matches including the men’s semifinals, women’s final and men’s final. Pinecrest Gardens is hosting its annual Chili Cook-Off event featuring country music bands, line-dancing, mechanical bull rides and lots of chili to taste. Tickets start at $5 and admission for Pinecrest Gardens members is free. Date: Mar 21, 2019-Mar 24, 2019 Location: AmericanAirlines Arena 601 Biscayne Blvd, Miami, FL 33132 MAP Cost: Tickets start at $16! Discover the full story of Disney’s Frozen like never before at Disney On Ice presents Frozen! Be a part of Anna’s adventure to find her sister, Queen Elsa, whose icy powers trapped the kingdom in an eternal winter. Join Olaf, Kristoff, and Sven as they encounter wintry conditions and mystical trolls in a race to bring back summer. Hosted by Mickey and Minnie, your whole family will sing along to unforgettable music and be delighted with special appearances by the Disney Princesses, Woody, Buzz, Dory and more. Experience magic at every turn and create memories to last a lifetime at Disney On Ice presents Frozen - the show worth melting for! This colorful score is the perfect match for the passionate art of the legendary Mexican painter Frida Kahlo sung by Soprano Catalina Cuervo. Wracked by agonizing physical pain and caught up in a stormy marriage to Diego Rivera, in his FGO debut, Bass-baritoneRicardo Herrera. Of the fifty-five self-portraits she created, perhaps none is as revealing as the one in Rodriguez’s opera. Returning to FGO as Revival Director and Choreographer is Marco Pelle from theNY Theatre Ballet. Roberto Kalb will make his FGO debut as Conductor after being an assistant conductor in previous seasons. Sung in English and Spanish, with projected translations in English and Spanish. Two hours and 30 minutes including one intermission. A highly awarded American pianist, Sara Daneshpour’s accolades include winning the 2nd prize at the 2017 International Rubinstein Competition and many more. As a regular performer throughout the US and internationally, she has been praised as “a pianist capable of both grand gestures and introspection.” – The Philadelphia Inquirer. Join us for this special free recital! Inspired by actual events, Memphis follows the story of Huey Calhoun, a fictitious white radio DJ who was one of the first to play black music in 1950s Memphis, and Felicia, a black club singer who is hoping for her big break. Filled with laughter, soaring emotion, forbidden love, irresistible dancing, rhythm and blues, and roof raising rock ‘n’ roll, this winner of four Tony Awards including “Best Musical” features a Tony-winning book by Joe DiPietro (I Love You, You’re Perfect, Now Change), and a Tony-winning original score with music by David Bryan, one of the founding members of Bon Jovi. Outdoor farmer’s market takes place every Saturday from January 19th through March 30th, 2019 and features produce, gardening workshops, cooking demonstrations, children’s activities, gourmet foods, baked goods, trees and plants. Loft style apartment at Dadeland. 13 FT ceilings add to the spacious feeling of this open plan 1 bedroom, 1 bath + den. 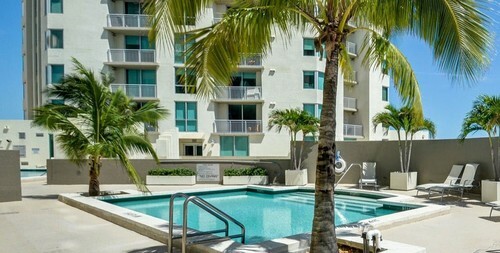 Metropolis Dadeland, walking distance to Restaurants and shopping. 2 swimming pools, Jacuzzi, fitness center, recreational room 24 hr concierge services and valet parking.